I have yet to become very comfortable with painting but have dabbled in acrylic, oil and watercolour. I am currently enjoying playing with some watercolours and will post images as they become available. This was my first attempt at any kind of painting. During my senior year of High School we were required to do a ceiling tile. 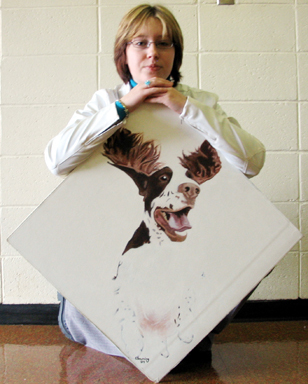 I chose this image of an English Springer Spaniel.